1. Finley got the first 2 books of the Finley Flower's book series for Christmas. For obvious reasons, she is obsessed with them. The first book is about Finley's attempt to make an unusual supper and so Finley asked if she could do this yesterday and we agreed. For supper she made spaghetti and was only going to use sriarcha hot sauce as the sauce. Greg asked a few times if she was sure she didn't want spaghetti sauce with it and finally she conceded but she did add both chili flakes and sriarcha to the sauce. She left a bowl without the added hotness for me thank goodness. She also wanted to make dessert and settled on cooked egg noodles topped with melted chocolate chips and marshmallows. 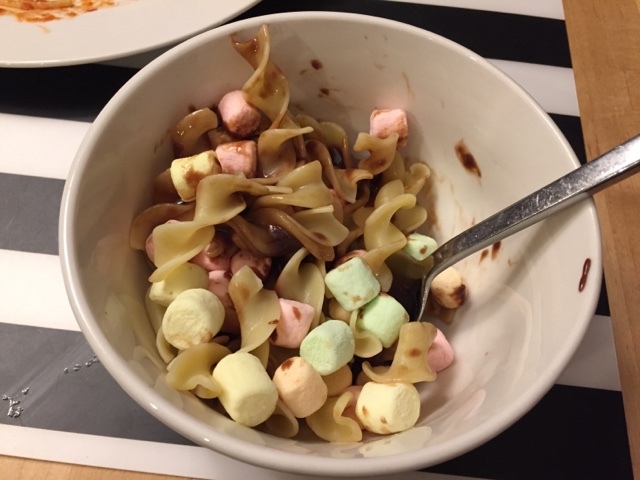 The pasta and chocolate tasted fantastic but I don't love marshmallows so I didn't eat those. Finley didn't finish her dessert so I suspect that she didn't like it much. Next Thursday, Penelope asked to make supper too so I am excited to see what she comes up with. 2. We got Pizza fixed on Tuesday. Because we have no real idea of how old she actually is, we decided to err on the side of caution and get her fixed right around the 5 month anniversary of us getting her. We kinda lapsed on this with Luci and she went into heat and then we got her fixed when she went into heat and it was expensive although I think now we paid more for Pizza then for Luci haha. Pizza was terrified at the vet and hid under the desk so I had to crawl down and get her out. The surgery went well and we were able to pick her up that afternoon. 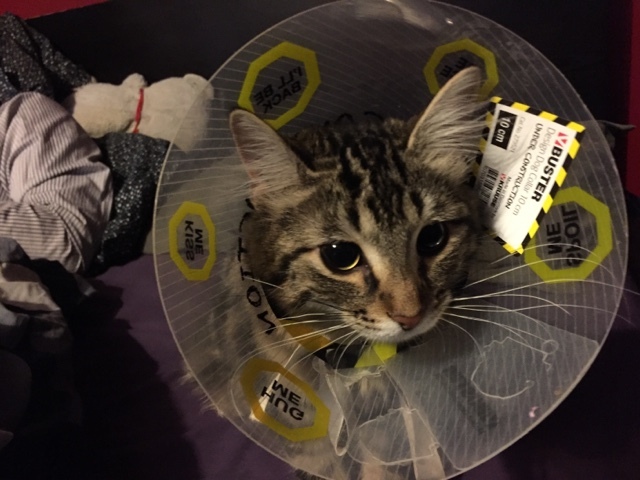 She was sent home with a cone to wear and 3 days worth of pain killers for her to take. They said it would take awhile for her to get back to her usual self and I think if it weren't for the cone she would be. She has slept a lot but she's always been a sleeper. She just can't chase and bite your hands because of the cone. She has to keep the cone on until Tuesday and despite hating it with all her glory, she is getting used to it. The vet was very impressed with how big she has gotten and how nice her fur has become. Pizza is a very happy and healthy cat! 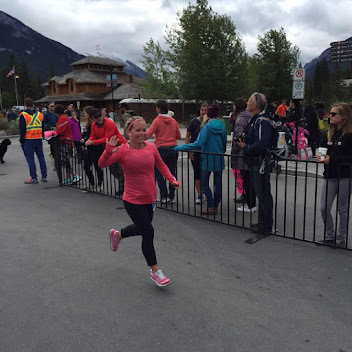 Woohoo!!!! She actually loves taking her pain medication because we have to give it to her via syringe, which is how we fed her when we first got her. I think she was more then a little disappointed when all she got was a squirt of liquid hahahah. 3. For Christmas, I got Greg a sous vide machine. I had never ever heard of these before but they appear to be quite popular. Blue Star Diner, which is one of my favourite restaurants here in Calgary, use a sous vide machine too. They can range in price from about $200 to $600 here in Canada. I bought Greg's on black Friday online and got it for $120 instead of $200. This is the one he has HERE. 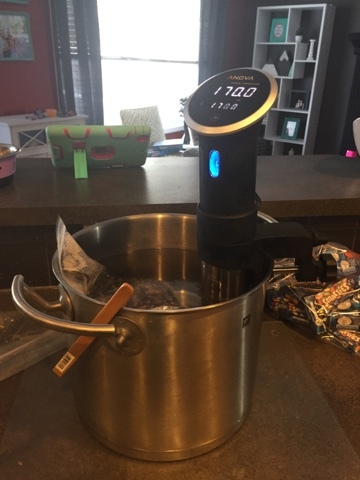 According to Wikipedia, Sous Vide means "Under Vacuum" in French and is a method of cooking in which the food is sealed in a vacuum sealed plastic pouch than placed in a water bath or in a temperature controlled steamer for longer then normal cooking times (6 - 24 hours). The intent is to cook the item evenly, ensuring that the inside is properly cooked without overcooking the outside and retain moisture. Once it is finished cooking, Greg finishes it on the stove or with his cooking torch. Greg has used this machine nearly the entire Christmas break and every weekend since. I have liked everything except for the pork tenderloin and salmon. When his family was over before christmas, he sous vide a basic roast into what tasted like amazing prime rib. He made a duck and turned into one of the best meals I have ever had. He uses it to make perfect poached eggs and they are delicious. I must admit that I wasn't totally into this machine but I have come to absolutely love it and look forward to what Greg will make with it each weekend. 4. 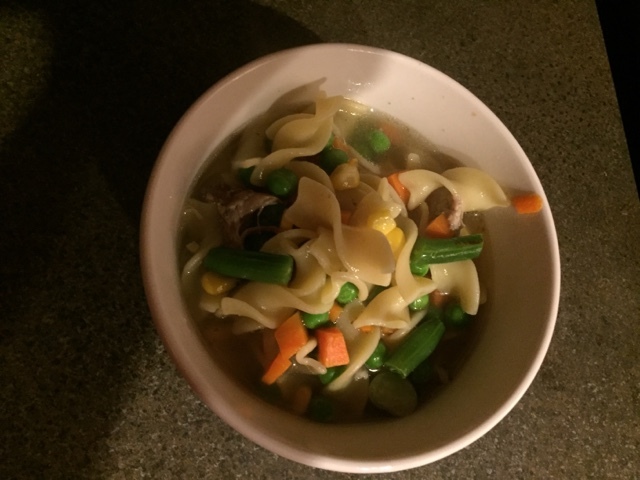 With the bone broth that Greg made with the duck he made in the sous vide and the left over meat, I made my first ever successful homemade soup. I have tried many times before with no success but this one turned out. Greg made the broth and had the duck cut up ready for me to use. He then texted me step by step directions on how to do it. I was very happy with how good it was. And I made enough to provide us with leftovers for lunch for everybody for several days. 5. This marks the end of our first week back to school in 2017. It has been a tough adjustment for the girls and they are struggling to get up in the morning. I try to send them to bed early on non-soccer nights and right to bed once we get home from soccer but they stay up reading in their rooms no matter how many times we tell them to turn out the lights. I even have let them sleep in until 730 to get extra sleep but it is not helping. I told them this morning that if they don't go to sleep 30 minutes after we put them to bed, then I am going to remove all the books from their bedroom and they will only get to read after school or before they go into their bedroom. I don't want to stop them from reading because they both love it and I believe it's a good love to have but I also need them to make sure they are getting enough sleep each night and they definitely are not. I welcome any suggestions on how I can make this better work for all of us.